Yeah, you read heard me right, with this quiz, you can test your musical visual intelligence. This is a logic test that attempts to measure one’s ability to correlate musical phrases with abstract shapes and symbols. It’s nothing like any test I’ve ever taken before and it’s quite interesting. 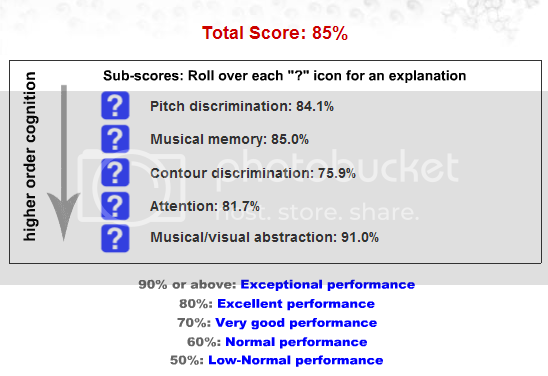 My total score was 85%, meaning I got 17 answers correct out of 20. I could have done them all if I hadn’t been so hasty 😀 Go on, test your abilities and shows us what you got. Publicat în categoria tests, etichetat amvi, music test, music visual test pe 28/09/2009 de irina.